Leo Estrada was a fierce and effective advocate for Latino voting, civil rights and representation prior to his death in November 2018. For 40 years before his retirement in June 2018, Estrada devoted his time and talent to research and teaching new generations of urban planners. But, for the Texas native who first arrived at UCLA in 1977, his career was also marked from the beginning by civic engagement, leadership and giving back. 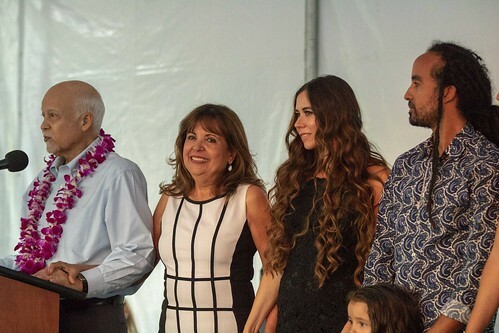 A June 11, 2018, retirement celebration in honor of Estrada recognized his decades of scholarship, service and accomplishments as an associate professor at UCLA and the UCLA Luskin School of Public Affairs. Estrada was one of the first urban planning scholars to teach and institutionalize courses about diversity and planning, said Loukaitou-Sideris, who is also associate provost for academic planning at UCLA. “As if these accomplishments have not been enough, Leo has also served on a number of important university shared-governance posts,” Loukaitou-Sideris said at the time. His most recent leadership post was no small assignment — guiding the direction of UCLA for years to come as chair of the Academic Senate in 2015-16. UCLA Luskin colleague Fernando Torres-Gil said last spring that Estrada also conducted pioneering work in the fields of gerontology and Latino aging. 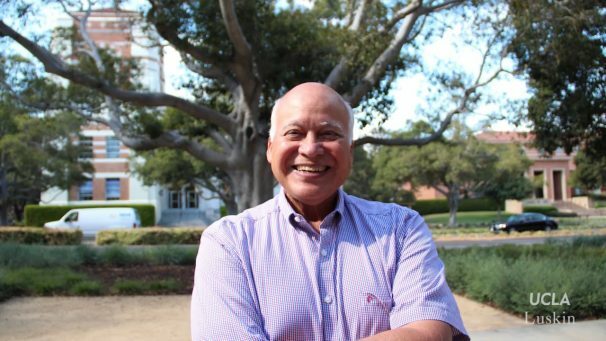 According to Torres-Gil, Estrada was among the first and longest-serving Latinos in the Luskin School and its earlier iterations of Social Welfare and Urban Planning at UCLA. Estrada had been at UCLA during its growth into one of the pre-eminent universities in the world. But Estrada encountered a different attitude in an interview with his first boss at UCLA, the late Harvey Perloff, known as the “dean” of American urban planners and iconic early leader of UCLA’s Graduate School of Architecture and Urban Planning, as it was then known. Estrada dove into issues in Los Angeles, then the Southwest, then across the country. “One of the things I had was a skill in mapping, and so I became involved in redistricting issues” in cities including San Diego, Sacramento, Albuquerque, Chicago and New York, he said prior to his retirement. Estrada’s community involvement put him at the forefront of issues in Los Angeles — including the beating of Rodney King in 1991 and the formation of the Christopher Commission to examine use of force by the LAPD. Estrada recalled answering his home phone one night about 8 o’clock. “It was Tom Bradley. You don’t expect to receive a call from the mayor,” he said. Bradley invited him downtown the next morning to talk about serving on a commission. Estrada didn’t have classes that day, so he agreed. Relations between police and the public had been deteriorating in Los Angeles for some time. The Christopher Commission concluded that a breakdown in LAPD management created a culture that tolerated the excessive use of force. But the following spring, the acquittal of four officers involved in the beating triggered the Los Angeles riots, which led to scores of deaths. Estrada’s fascination with the planning profession never waned. “I’m just pleased by the way we expanded into new fields, never got stuck in a status quo. [We’re] always looking for new ways to make planning relevant to all aspects of urban life,” Estrada said. In some ways, the field has become more complex, he said, but planners have access to new technology that didn’t exist a generation ago. “As long as people really believe in trying to make this a better world, we can make things happen,” he said. As he approached retirement, Estrada decided he needed to give back. He had previously served on the Undergraduate Council and Academic Senate, and in 2015 he stepped up to chair the Senate, which allows the faculty to participate in governing the university. “I gave back a lot more than I was expecting,” said Estrada earlier this year. “Some things were controversial. He added, “Leaders of the Academic Senate … work every day to make the faculty at UCLA the best that it can be. In preparation for the retirement celebration, students and colleagues from all three UCLA Luskin departments recalled the essential role that Leo Estrada played in their education and careers. Nina Flores, UP Ph.D. ’16Assistant Professor, Social & Cultural Analysis of Education, California State University Long Beach. Learning Life Lessons About Urban Planning Hundreds of L.A. high school students discover meaning of social inequality in city planning during Luskin’s Youth Empowerment Conference. Sometimes, lessons are learned the hard way. That was especially true for some Los Angeles high school students who recently came to UCLA to learn about city planning. “It wasn’t fair,” high school sophomore Ashley Flores said after participating in an exercise designed to teach teenagers that life — and urban planning — aren’t always equitable. Planners of Color for Social Equity (PCSE), a graduate student organization housed in UCLA Luskin’s Department of Urban Planning, recently hosted more than 200 high school students from the East Los Angeles Renaissance Academy’s (ELARA) School of Urban Planning and Design at the 4th Annual Urban Planning Youth Empowerment Conference (UPYEC) held in Ackerman Ballroom on the UCLA campus. A day of urban planning workshops and activities, UPYEC provides high school students with opportunities to learn lessons about education and life. Every high school student participated in an exercise called Spatial Justice. Students were divided into groups and assigned spaces in which to build their own “city.” What the participants didn’t know was that conference organizers had distributed building materials inequitably, presenting obstacles that mirror real-life city planning. Luskin’s Urban Planning students volunteered to facilitate the workshop, role-playing as city hall administrators who regulate the building development process. While the spatial justice workshop was intended to educate students about how planning presents obstacles, it was also intended to encourage students to use planning as a tool to undo these injustices. This was the intent of the discussion portion of the workshop, Luskin students said. In addition to Spatial Justice, the students attended workshops on active transportation, community organizing, food access, urban design, the urban forest and mapping of transit routes. One of PCSE’s goals for the conference is to diversify the field of urban planning. In 2012, PCSE learned that ELARA was located in East Los Angeles and is one of only three schools nationally with an urban planning program, making it a great fit for the organization’s community outreach goals. PCSE received funding from the Grad Student Association Sustainability Resource Center, the Healthy Campus Initiative, the Campus Programs Committee Youth Fund from the SOLE office, the Grad Student Association Discretionary Fund, the campus Event Fund, and through a Diversity Development Grant from the Luskin D3 (Diversity, Disparities and Difference) Initiative. Visiting scholar Alvaro Huerta creates new type of work, where he conducts research, writes, and teaches, but also works in the community. He’s organized a hunger strike for gardeners but he’s also written children’s stories. He’s an accomplished academic but also a passionate activist who in 2005 was honored with the Charles E. Young Humanitarian Award for creating the Gardener Leadership Development Project. Alvaro Huerta ’03, M.A. ’06 is the face of the new America, bridging the gap between scholarship and social activism, bringing to both the insights and perspective of a son of Mexican immigrants. Read the full article in UCLA Magazine.